Back in the 60′s there was an advertising campaign saying “Buy Australian and your money comes back to you”, every school boy and girl was taught to buy Australian. Sadly this doesn’t happen today. 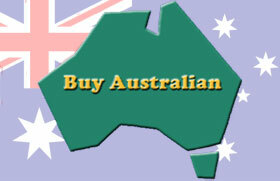 There are a multitude of businesses in Australia that produce quality Australian Made or grown Products for sale, regional, nationally and around the world. Many of these businesses are small and are in regional Australia. Businesses owned and staffed by Aussies who wish to widen their sales opportunities, improve their sustainability and support Australian innovation and development. By using this site, you will become one of our growing numbers of supporters. To view profiles of our producers – please CLICK HERE or click on the ‘Suppliers’ tab at the top of the screen. To search for a product that you need, please CLICK HERE or click on the ‘Search’ at the top of the screen. If you like this site – tell your friends – like us on Facebook.